KESTI – a network project for new technologies and methods for sustainable urban development in the Baltic Sea Region aims to promote new forms of sustainable technologies and practices in urban and residential environments planning. Volume: 345 000 €, funded by European union (European Regional Development Fund) and the partner cities (see below). The project will identify five successful eco-efficient, low-carbon urban development sites in the Baltic Sea region. These sites are then visited and benchmarked. The benchmarking trips are planned and executed on the basis of the challenges and needs identified by the cities in the network. A symposium held in Finland will complete the project. 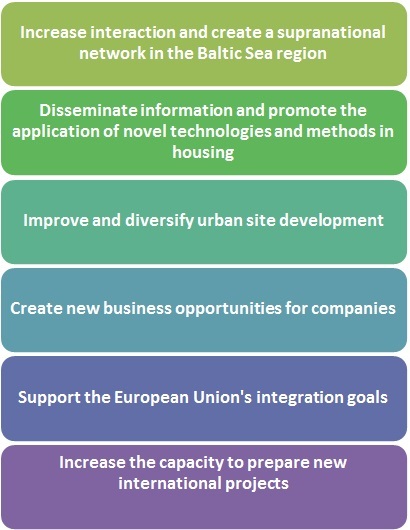 The benchmarking perspectives are accessibility, community energy efficiency, more efficient use of space, participation of the residents and a user-driven approach, the quality and organisation of housing and construction, smart solutions (housing, energy, transport, services) and timber construction. At the destinations we will form networks with local players and conduct in-depth benchmarking analyses by comparing elements such as development processes, cost-efficiency and overall effects. The choice of destinations is based on their suitability for the dissemination of new knowledge and expertise. The participants to be invited include the partner cities and other municipalities, the stakeholder companies and those interested in new technologies and methods of sustainable urban development. The EU’s climate and energy target 20-20-20 and tightening building regulations require low-energy solutions for residential construction. In Finland, the construction phase and use phase of buildings account for 40 percent of total energy consumption and 30 percent of carbon dioxide emissions. Increasing energy efficiency in housing reduces emissions and increases energy savings. The project is based on the need to mitigate climate change and to develop international interaction in the Baltic Sea region. It supports the European Union’s integration goals and improves the ability to prepare new joint international projects.